Pirates have been on my mind lately. I just finished Laurie R. King’s latest novel The Pirate King and, with Halloween approaching, it is the time of year when memories of marauding madmen (and a few women) haunt our imaginations; from the fearsome Captain Hook to the more affable Jack Sparrow. 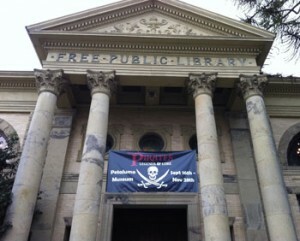 The giant Jolly Roger stretched across the entrance to the Petaluma Historical Museum announcing Pirates: Legends & Lore has been beckoning me for weeks and finally lured me in for some pirate history and treasure hunting. A towering mast greets you when you enter the Pirates exhibit, reaching up towards the colorful stained glass ceiling of the museum. With our entry we were given a treasure map to follow on our journey; a completed map would earn us a “gold” doubloon! En route we caught a glimpse The Lost Pirates of Petaluma, learned the origins of the Jolly Roger, tried our hands at tying seaworthy knots, met the legendary pirates of old, smelled the fragrant spices of early sea trade, and picked up some pirate lingo. Who knew that so many everyday phrases were popular pirate sayings? “To show your true colors” came from the practice of raising false flags to fool your opponent into thinking you were an ally and then at the last minute raise the Jolly Roger and start a fight. Younger privateers will find plenty to keep them busy, including pirate puzzling and materials to craft their own Jolly Roger. We solved our treasure map and earned a “gold” doubloon (ok, a plastic one, but my son loved it! ); now we have embarked on a more serious hunt for treasure. (I share this information to my disadvantage, as the more of you who embark on this same quest the lessor my chances of success!) For the nominal investment of $2.00 we have acquired a map of clues that will lead us around Petaluma. If our answers are correct we’ll have a chance to win a real silver pirate coin from the ship Santa Maria La Conception worth $500! The drawing will be held on November 27th. Are you up for the challenge? Pirates: Legends & Lore is full of fun facts and information about the shadowy world of pirates, blending the real history of pirates with the romantic imagery of literature and movies. The dastardly deeds of these real life picaroons have captures our hearts and imaginations, giving us a litany of pirate inspired works from Stevenson’s Treasure Island to Disney’s The Pirates of the Caribbean. Bring family and friends and enjoy the search for your own treasure in and around the Petaluma Historical Museum. And, if that isn’t enough of a pirate adventure for you, join the Pirate Cruise on October 31st, noon – 3pm, $35.00. The cruise is offered by Dolphin Charters; proceeds go to the museum. Cost: Adults, $5.00; 12 and under, $3.00; 5 and under are free.